Since 2004, we have been offering a driving safety training course for gravel roads, in which you will learn to cope with critical driving situations more safely and get to know your rental car in driving behaviour better. Under the guidance of experienced trainers you will learn different driving techniques, both for "normal" road traffic as well as for driving off the beaten track. How does a car behave at the limit? How do you have to react quickly and, above all, correctly in order to successfully prevent an accident? These are skills that most drivers who come to Namibia lack. A driving safety training course is a decisive contribution to your safety on Namibia's roads. Uwe Schulze Neuhoff has been trained by ADAC Fahrsicherheit GmbH in Bonn, Germany. 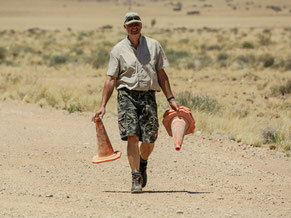 In our safety training we simulate typical accident situations on Namibia's gravel roads. The training is suitable for beginners as well as for experts. In theory and practice, you learn to recognize dangers at an early stage and can safely test your personal and physical limits. 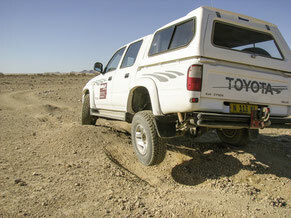 Testing your own limits and those of your 4x4 vehicle is a big challenge. In the Ababis Off-Road Experience Center, you can discover what an off-road vehicle has to offer. After a theoretical introduction, you will train various substrates and terrain formations. 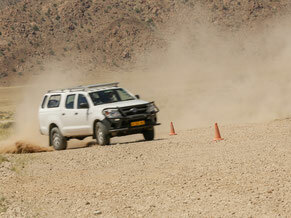 Our varied off-road-course in our mountains offers you enough practice situations under personal guidance.